The Trump administration has instructed it's DHS personnel to build a database of journalists and “media influencers.” Presumably since the President equates “fake news” with “said bad stuff about the me” this database will be used to retaliate either through direct punishment or denial of access or both. The Free Speech and Freedom of the Press implications are obvious and are being discussed, but not with the details of implementation. Those details do not make the implications more palatable to anyone who lacks a totalitarian heart. Details often escape the mainstream media, who are proven incapable of collective self-defense. The actual contract request for bids is a public document with a contract number, a date by which interested bidders must register, and a time line after award of the contract for implementation. The contract solicitation number is RNBO-18-00041 and it was released on April 5th. The time between award and implementation is 5 days. The date of award is not listed but the final date for throwing your hat in the ring is April 13th. With all the other parts of the process being so short it is safe to assume that the time between end of biding and award will be comparably short. The Department of Homeland Security should have it's list of 300,000 literate people who speak in public by the end of the month, making Donald Trump more efficient than Cambodian dictator Pol Pot who was the last person who did a similar thing, and with fatal results. 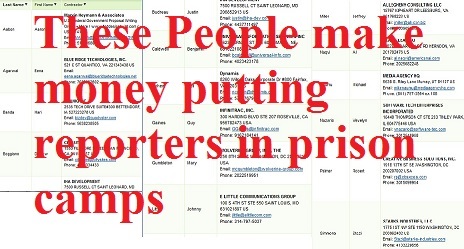 Today is April 9th and as of lunchtime in the Eastern Time Zone, 17 companies have announced they intend to bid on the right to decide who gets shipped to the camps for saying bad things about the President. Seven of the 17 are also-rans completely unworthy of note except for the fact that they wish to bid. They have no hope against the competition are basically over engineered web design firms. Another also-ran is Columbus Ohio's own Stark Industries LLC, who is using the appropriately named Stazi Simmons as their DC contact. They specialize in the monitoring of personal medical alert devices. Perhaps they feel this is an appropriate contract because in the killing fields everyone who has fallen can't get up. They keep an office across from the Statehouse on South Third Street and can be reached at (614) 324-3264 if you want to wish them luck in their quest to profit from sending reporters to camps. Two PR and marketing firms threw their hats in ring. One is Universal Information Services of Omaha Nebraska, which does social media tracking in addition to being a press clipping service and generic PR firm. The other is E Little Communications Group of St. Louis, who provides Crisis Management PR Services to McDonald’s and Provident Bank. They also provided Crisis Management Services to the City of Ferguson while the latter was brutalizing anti-police brutality demonstrators in the streets in 2013. It is safe to say that where there is a human right being trampled, E Little Communications sees a shinny nickle for itself under the jackboot. The final seven are all defense and/or intelligence linked. Martin Heyman and Associates has a top secret clearance and worked for NASA, the Department of Energy and the marine corp. Quayster works for the Army, Navy, Department of Justice and the Federal Reserve. IHA works for the Navy and the Defense Logistics Agency. Dynamis already has contracts with the DHS as well as the DOD, NATO, the National Geo-spatial Intelligence Agency and the Department of Treasury's counter-terrorism division. Ludley and Jeff Miller, the husband and wife team that make up Allegheny Consulting LLC have contracts with ICE and the World Bank. The generically named Software Tech Enterprises has contracts with the IRS, FBI, ICE, Department of State, NIH, TSA and Freddie Mac. Creative Business Solutions Inc. seems to do everything through larger subcontractors. The list of their strategic partners includes Edward Snowden's former employers at Booz Allen Hamilton, SAIC, CSC/Dyncorp whose employees trafficked young girls in Bosnia and CACI who had contractors supervising interrogations at Abu-Gharrib. Together, the bidders on this list and their connections read less like a group of would be federal profiteers and more like a time line of war crimes and human rights violations from the past two decades. This is who will be making a list of people who write bad things about the president. This is who is about to decide what journalists are permitted to write in America. There are four days left for other corporations to announce their intention to bid. One wonders what else will float to the top of the swamp that is Department of Homeland Security Contracting.